You may be asking yourself, what is encaustic? Encaustic painting has a rich history dating back to the 5th century B.C. The medium is a wax based paint (beeswax, resin and pigment) which is then heated on a warmed palette or palettes in my case. The hot wax is applied to an absorbent surface such as a cradled birch panel and then reheated in order to fuse the wax I use a combination of fusing tools – blow torch, heat gun and a tacking iron. Encaustic paintings have lasted thousands of years without flaking, layers separating or colors fading. Encaustic paintings are exceptionally durable and archival due to the medium being a natural preservative, moisture and mildew resistant. Because of their archival characteristics encaustic paintings will not yellow or fade with time. For artwork care, I tell collectors to simply use common sense with any type of painting. However, encaustic paintings are more temperature sensitive and should not be exposed to direct sunlight or extreme temperatures. For instance, it would not be a good idea to put an encaustic painting in the trunk of your car on a hot summer day or during a blizzard. I probably would not hang a painting over a radiator, in an excessively steamy bathroom or inside a walk-in freezer. Encaustic paintings do best in temperatures between 40–140° fahrenheit . Think of your painting as your pet. I’m kidding. Just be mindful of your new painting. Even though one of the contemporary design trends is to not frame paintings, I am still a big fan of framing for the simple reason that it offers extra protection against potential damage. I have had a painting fall off of a wall during an earthquake but because it was framed, the painting did not get damaged. Since the surface or sides of any painting can get dented, or scratched — the edges of encaustic paintings can be vulnerable to chipping — I highly suggest framing. Floating or ‘floater’ frames are my favorite recommendation for encaustic paintings as they offer protection while allowing the entire surface of the painting to be viewed. Occasional (maybe once a year) very gentle buffing or polishing of the surface of an encaustic painting with a soft lint-free cloth will help maintain the unique gloss/patina of the wax and remove any naturally occurring ‘bloom’ that may appear. You will receive a lint-free cloth with each encaustic painting purchase. 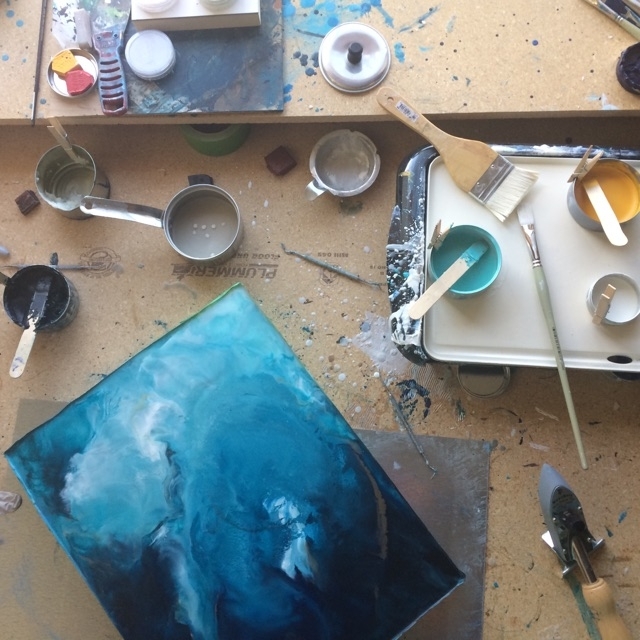 Are you interested in purchasing an encaustic painting or having an encuastic work commissioned? Please send a message to the studio. All questions welcome.